I had waited a long time. I had waited before I knew there was anything to wait for. Anything to anticipate. Then when I knew there would be more my heart sank. For I knew…I knew..that it would bring despair. That it would fail to emulate what Bladerunner was to me and that was a cornerstone of my artistic identity. When the date was announced for the new film Bladerunner 2049 I just had to see it. I had to. I had to know. So when tickets came online they were bought and to the cinema I went. I will ignore all that has been said about it being boring…you don’t get it. I will ignore the lack of cinema revenue…who cares it will be a legend. I will ignore the pedants who laugh at it…no one will remember them. My thoughts after nearly three hours in the seat is that Bladerunner 2049 is a masterpiece of film making and it restored my faith in the medium. The best film in a decade. The universe set up in the original film survived and was expanded. Atari and the Soviet Union are both still going strong. The visuals were stunning and the music…souring and epic. For me the giantess of the virtual billboard was a highlight. A core tenant in the film was the nature of what it is to be Human and the reactions of the Human with the Enhanced and now the Virtual too. All too relevant for the world as it is now and as it will soon be too. After all her eyes are blue but they should be green. I could wax on for an age. But I will not. I loved this film and I will continue to do so. Do yourself a favour and see it. Also do yourself a favour and ignore the critics and their screeching about feminism and other issues..they will never be happy. This film is a gem. 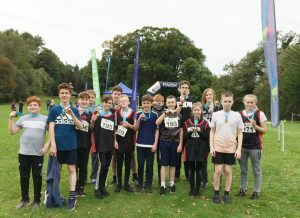 A hearty well done to my eldest son who won first place and gold in a decathlon held last week at Culzean Country Park. 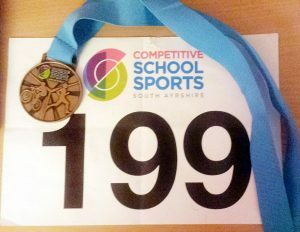 The event was organised by Competitive School Sports South Ayrshire and many schools in the area took part. Running and Cycling several miles each he came home tired but elated. Running was never on the cards for me as a teen. Too big, too heavy. Rather it was Rugby and Chess for me..plus wargaming of course. I am proud of my lad hence this little post. Effort brings rewards in this family and a reward is incoming soon for him. I had the pleasure last night of attending the 2016 Festival of Light Life Cycles with my family along with close friends. 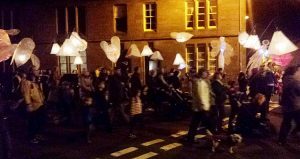 This annual event takes places in the small Ayrshire sea side town of Girvan where I live and in a procession involving more than a hundred people a trail of light is taken to the sea front. 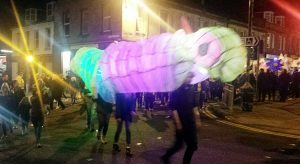 Children and adults who have spent many weeks making lanterns of various sizes all come together lanterns lit while the excellent Samba Ya bamba band plays at their head. They walk through the town while the crowd applauds and dances a bit moving alongside the procession. As you can see from the images it was very bright and fortune was on our side as not only was it dry but it was mild and not even a breeze which anyone who comes to Girvan will tell you wind is a constant here. 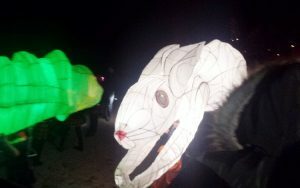 The procession featured a hundred, to my estimation, lanterns in various shapes as well as larger battery powered and back pack carried creations such as a glow worm and a white rabbit. I joined the procession near its end as it moved to the promenade. This year an excellent development at the sea front with the inclusion of a portable generator and lighting rig making it possible to navigate and proceed easily. 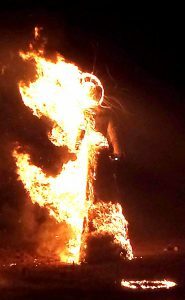 The band marched onto the sand and continued to play while the crowd gathered to watch the straw structures on the sand be lit and burned as a climax to the procession. 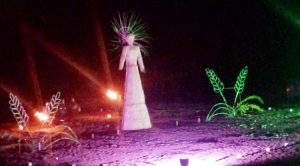 Two large ears of corn with a titanic corn lady with halo in the centre. About twenty feet in height she was lit last as fireworks were let off and the band played. Many of the photos I took were blurred and no good but these are the best of them and I have enhanced them for low light. It was a very effective display and my children enjoyed it. I have put pennies and small change into the collection bottles dotted around the town across the year and was glad it was well spent. Soon is the Girvan Fireworks event…I am looking forward to that, oh and the Christmas Street Party too. Excellent. In a fairly rare break from my normal life of work and family I took a few days off to treat my good lady to a birthday treat trip to Edinburgh at the weekend just past. We had a really nice time and the weather held up for us too. I want to share a few things we did (not all of them as I do not want to bore you or make you faint!) while there. 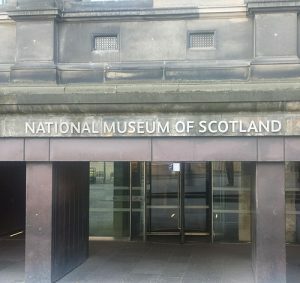 The main thrust of this posting is the National Museum of Scotland which we spent a very enjoyable full morning inside (it would have been longer if there had been seats in the tea room for a lunch date too! But alas too busy) and here are some photos I took of objects and such that most interested me. Above is the view to the right of the main group floor of the museum and it was a delightful surprise to see the natural light entering from the glass ceiling of the nineteen century iron structure and around its floors. To the left you can see the main light taken from a late Victorian light house. 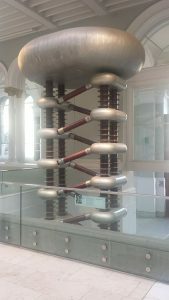 Below is a photo I just had to take of a small part of a mid twentieth century ‘Atom Smasher’ used by several different universities in the 1950’s..sadly not in use. 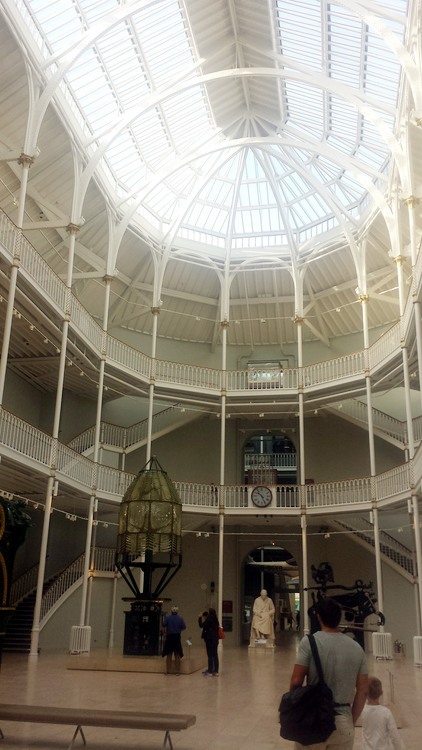 The museum is divided into several sectors which are represented upon each of the floors as you ascend. 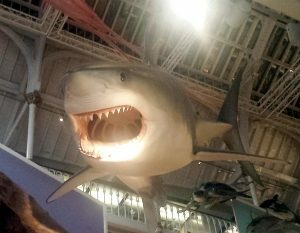 With each telling a rolling story they are excellently done and while the nature element does not especially interest me the Great White Shark hanging from the ceiling upon invisible wires was actually rather scary and you can see it below. I was more interested in the civilisation (read as Mankind but sadly that is not a word allowed anymore) and the science hall. 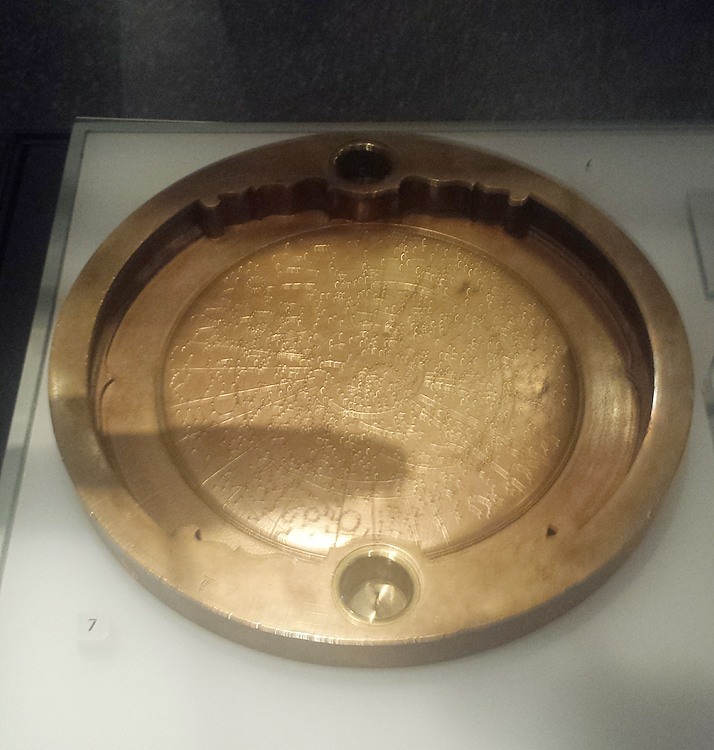 A superb presumably solid gold Japanese planetsphere which dates from the seventeenth century which shows the night sky not as pictures but as a series of straight lines. The photo does not do this object justice at all and the level of detail is amazing and its finish is undimmed by time. The next two photographs appealed to the Flintloque writer in me. 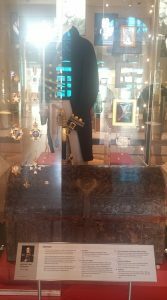 The uniform of Thomas Cochrane worn upon the ship Liberator which is well worth looking into and an oil painting by Arthur William Devis. The fall of Seringapatam and the death of the Tipu Sultan (not actually killed by Richard Sharpe!) 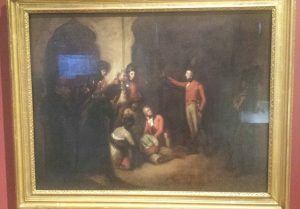 in 1797 which was an event one of my favourite British officers was part of; Major General David Baird. The reality of biological sciences was brought to life for me in the next room in the form of the actual (I checked!) 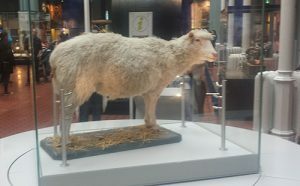 Dolly, the world’s first cloned animal in 1996. For more on Dolly follow the link here as it is a fascinating and important area of research. 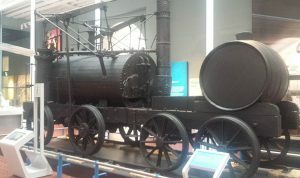 After this was Wylam Dilly locomotive which while not being anywhere near as famous as the ‘Rocket’ is one of the oldest surviving machines there is from the early age of steam and rail along with Puffing Billy. The resourcefulness of human nature and in war caught my eye with a suit of armour plus weapons from Kiribati entirely made of coconut fibre. While utterly useless against any firearm and most bows as well it does stand up to crushing and impacts from wooden weapons rather well. One of the real highlights of the whole museum was the change to read up upon and actually see (yes, I touched it, naughty me) a part of the acceleration cavity assembly from CERN which as you will know is the place of the Large Electron Positron Collider. Twenty seven kilometres of underground tunnels to smash electrons and positrons together. 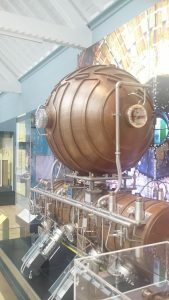 I find this actually more impressive than four thousand year old tombs and such as it is the future and an incredible feat of engineering and physics. Peter Higgs nobel prize was ensured when the ring proved the existence of the ‘god particle’. After all this I took the time to get a snap of the view down to the entrance foyer from where we had started our experience in the museum. An excellent idea for a half day visit and for children lots to do as well. 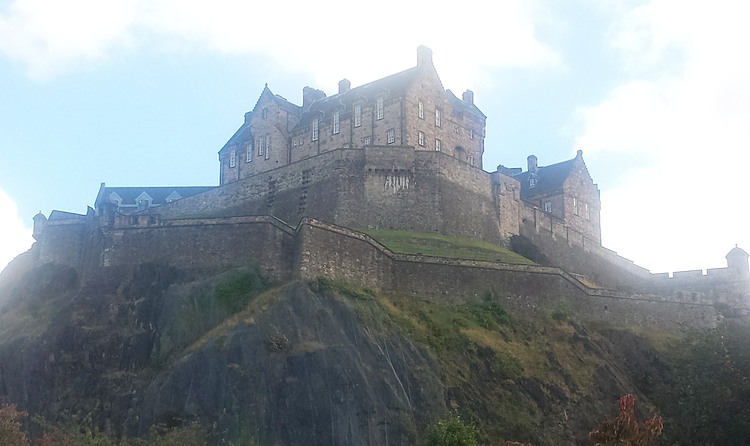 Edinburgh was mobbed with tourists…I mean really busy…so I gave up trying to get into any other events or places and instead just went for a sunny stroll in the park getting a good shot of the castle upon the rock from an angle not normally used by TV reporters or postcards and such. 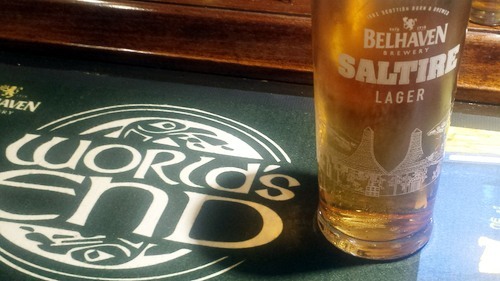 Lastly a shout out to a great traditional Scottish pub that does excellent food and service too along with some superb ales. 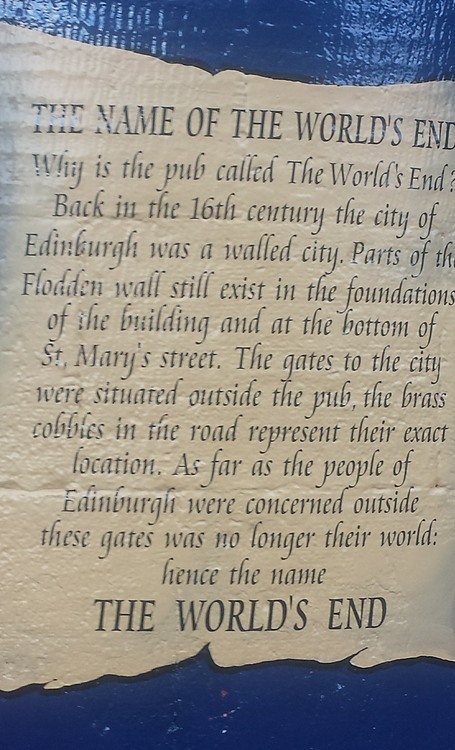 It is small but try to get a table and a late lunch at the World’s End pub at the foot of the Royal Mile. Friendly and with a great atmosphere I took a few photos to show you firstly what I had to drink (Saltire is not easy to get in Ayrshire) and then the outside wall of the pub with its origin tale. 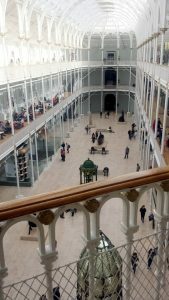 Thanks for taking the time to read this and if you get the chance I do recommend heading to the historical capital city of Scotland for a weekend. I had the choice between this trip and possibly Madrid. I did not get the heat but I got a bloody good time! 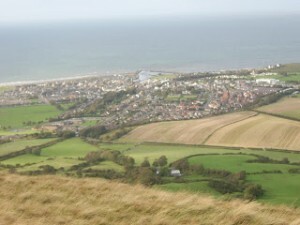 I have now lived in the town of Girvan, South Ayrshire, Scotland for ten years exactly. This anniversary kind of crept up on me really since I had kind of forgotten how long I had been here but since I was reminded of it by my lovely wife I decided a short blog post was in order to celebrate. So ten years. What does that mean to me? I came to Girvan knowing nothing of it. Not even a name on a map. A total unknown. I came with no expectations of the place more than the purchase of a place to live. In the time that has passed since then the town has changed and I have changed and do you know what we have both had problems and triumphs and I feel that we fit together well. The town is friendly and the people hardy and industrious too. Crime has not touched me and the summers have warmed me and the skies and seas nourished my children. To know the names of many people you pass in the street is wonderful and to have the chance to assist the community is great too. My work keeps to tied to a computer screen almost all the time and I have done well and achieved much in the environment that this little town has given me. I am happy here. 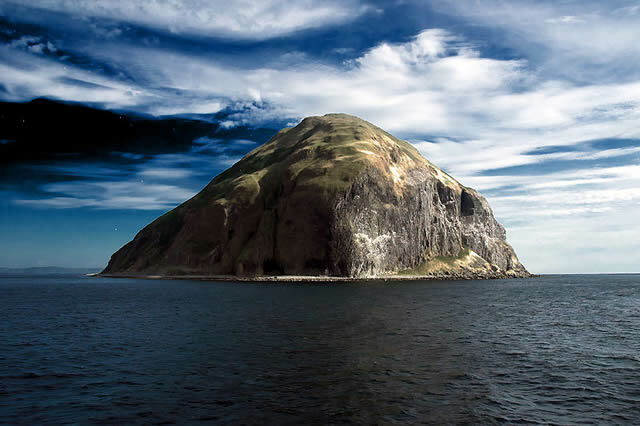 I have brought people here from the rest of the UK and Europe as well as North America and further afield as guests and they have all enjoyed their time in Girvan. 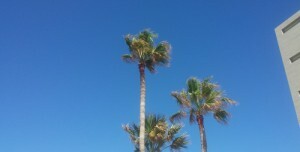 Admittedly those who came in the summer enjoyed it more! I will not get into politics or problems as this post is about my ten years a resident and I am sure some people reading this will disagree with them and point out issues. Issues like the Swimming Pool and empty shop units for example but those are by the side for me. All places have issues and I much prefer being here rather than in any city. Eyes bright and cheeks rosy. So ten years in Girvan…here is to ten more years from this man who was once a son of ‘Maither Glasgow’. Parent’s Evening. Its an event that most parents don’t look forward to. A couple of times a year you attend the local school at a given time and then the teacher tells you all about what your little darlings have been up to in class. What they have really been up to, not what they have told you after school each day. 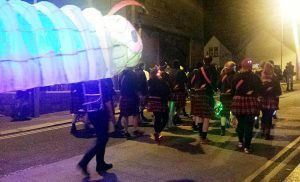 This was the event for me last night in Girvan. 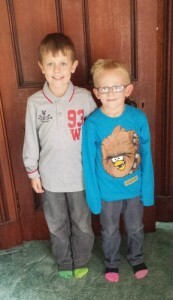 Now that only two of my three are at primary school for the first time it meant only two appointments rather than three which meant less running about making to a room on time. So how did the Poet and the Warrior do…. How they did was a ringing endorsement of the parenting that myself and mainly my good lady made an effort to keep to. Rewarding effort and initiative and punishing bad behaviour while giving the children as much responsibility as their ages can allow and not treating them as anything less than capable within their own limits. It works. It really does. Both were given top marks with remarks made about their healthy attitude to life and high scores in tests and group work. I may have to rename the Poet since his tendency towards mathematics and numbers is becoming ever greater and the Warrior is so sociable that his name may also change. In short happy days. Well done my sons! Happy Birthday my darling wife. Though I sometimes do not pay enough attention to you know that I love you now more than I ever have. Know that I and our three wonderful children could not do without you and that you are the loving bond that holds us together. We have been together for a long time now but that has made us stronger and while those around us suffer their problems know that with me your future will always be golden and that you will always come first. One of the many pictures from today. 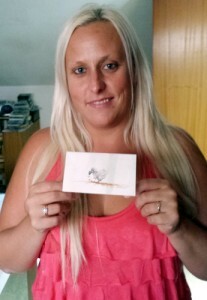 Special thanks to Edward Jackson who sent my fine lady another of his excellent Dodo cards. This one will join its fellows on the dresser in pride of place. A new convert to the ways of the Dodo. Enjoy your presents my love. I am back. Not that I ever really leave the virtual world. A week off work, the first in quite a while. It was nice and the fun did beguile. Not much to say really. I see no need to talk about it beyond that I enjoyed myself and got a tan. I like flying and heat makes a refreshing change too. Really the reason for this little entry was just to thank all those who wished me well on my time off knowing I don’t get a lot of it. Thanks chaps and ladies. It was Club Tropicana and the drinks were free…my dancing was not videoed…just as well really. Things are back off to a flying start though. What I am up to? Well click on these links to see. I had a great day on Saturday from the moment I woke up to the moment I went to bed late on after watching the taped new episode of Dr Who. Among the highlights I can share with the public the brightest was my trip to Collectormania 2014 in Glasgow. Its not often I get enough time together to do something like this but the trip had been planned for two weeks and I was raring to go. Why you ask..well for the chance to meet two childhood heroes of mine and the chance to get some new t-shirts too. I got the shirts and as you can see above it was a smaller sized event, nothing like Salute at Excel in London, but that was good for me. It meant that there was virtually no que to wait in for an autograph and it meant that you could actually spent a bit of time talking to the person too. Sylvester McCoy is a really nice person and it was great to be able to speak to him. 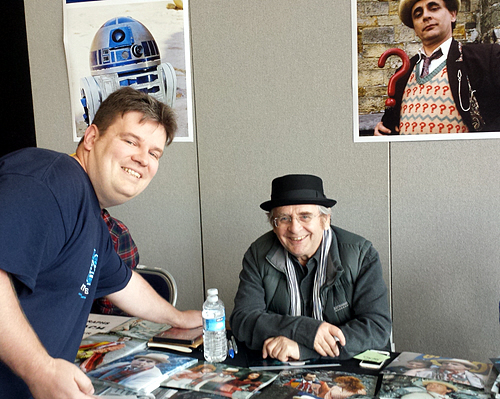 I did not mention the seventh Doctor once rather it was more a meeting of two men from the former region of Strathcylde. 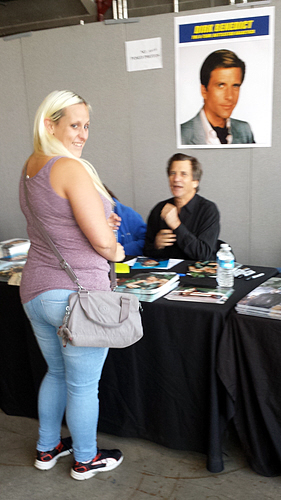 However for my good lady the star of the show was Dirk Benedict who took a real shine to her! After that he was quite happy to talk about the A-Team and his time as Starbuck too. 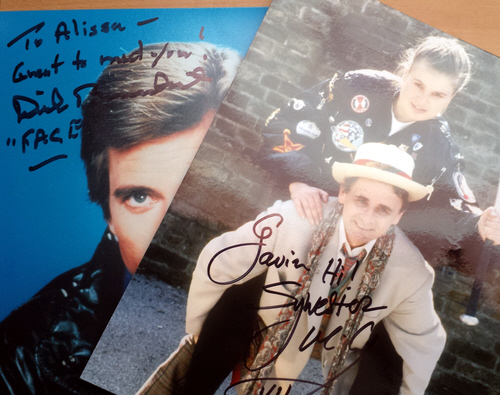 We got our autographs which my eldest son who came with us found quite funny. For you see I put no stock in religion or celebrity or anything else that is beyond my normal grasp as a Man. I take each on its own merits but actually conversing with these two put a grin on my face that he found amusing! 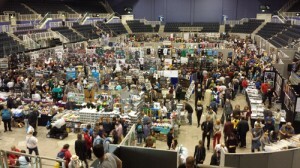 I might well go back next year. 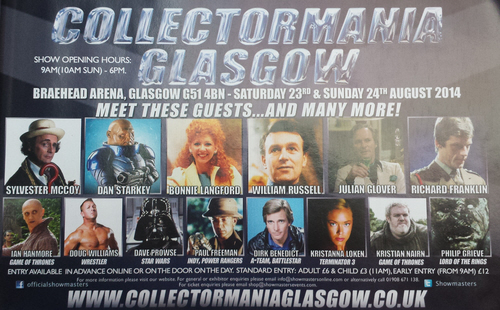 I missed Sophie Aldred as she was only there today and not Saturday. Shame but there is always next time. So I will finish on a last picture of my good lady with The Face Man as he was and still is known. Hands off mate…she’s mine! Today was the start of a new school year here in Girvan for my three sons. The Thinker, The Poet and The Warrior donned their new uniforms and took up their new jackets (it is Scotland so it was cold in August!) and bags and headed for the class rooms. This is an occasion for celebration every year but this year there was an extra event as my eldest was now attending secondary school going from a big fish in a little pond to a minnow in a lake. 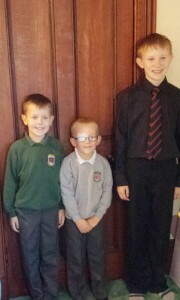 So he headed off to Girvan Academy while the smaller two went back a year up to Girvan Primary. As you can see in the image here they looked very smart indeed which is due entirely to my loving wife and not I who has now not shaved in near a week! As is the duty of all good fathers I asked each how their first day went. The replies were as follows starting with the youngest The Warrior. He said that school was cool, that music is now his favourite subject and that having a class smaller than last year made him happy. So a happy lad. The middle lad, The Poet, was more reflective and while musing over a new book of tales published in conjunction with the school (in which he had a full entry) said that he hoped it would be pacer quicker than last year as he liked a challenge. Now the eldest The Thinker looked all grown up in his shirt and tie and what did he think of his first day at a new school? With a weight of years he said it was a big change with many more subjects and a lot of new faces to get to know. He was most taken with the idea of responsibility in that he is now allowed out for lunch into the town as well as the canteen. A big day then and it was a pleasure to see once more what fine lads they are and how they will make their parents justly proud in years to come.